The ubiquity ofjet phenomena in young stellar objects, active galactic nuclei, sym- biotic stars, planetary nebulae and x-ray binaries has driven a broad literature on the astrophysics of collimated mass ejection. One of the fundamental open problems in star formation is the understanding of the physical mechanisms by which mass is ejected from the protostellar system and collimated into jets. Locally jets will regulate the system angular momentum and therefore its evolution during the first few million years. At large scale jets inject momentum into the cloud thus affecting its star formation efficiency and evolution. 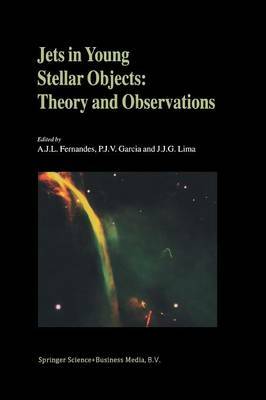 Many recent advances in the star formation field in both theoretical and observa- tional aspects together with the increasing availability of computational resources, conveyed for a perfect opportunity to organise this workshop which we entitled - Jets 2002: Theory and Observations in YSOs. The workshop main aim was to provide a rich and varied ground for discussion of thejet phenomenon in different astrophysical objects, covering interdisciplinary areas such as steady state winds, time-dependent winds/jets,jet energetics and jet/wind propagation. The workshop took place at the Faculdade de Arquitectura da Universidade do Porto from 3-5 September 2002 and was part of the Joint European National Astronomical Meeting 2002 organized by Sociedade Portuguesa de Astronomia.